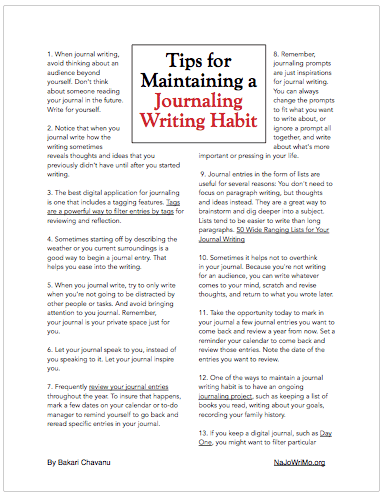 It is so great to receive feedback from participants of National Journal Writing Month, because I learn more about how they are using their journal writing, how useful NaJoWriMo is for them, and what I could do to help make their journal writing more useful. As NaJoWriMo April draws to close, I received a lengthy email from Steve, a NaJoWriMo participant. I got Steve’s permission to publish his email as a blog post. I broke up his writing into a few smaller paragraphs and I added subheadings, but other than that I made no other edits. I want share his frank response and reflections. Below is my response to the prompt for day 17 of the [Personal] Renewal NaJoWriMo. I make no promises it will make sense [Editor note: It makes plenty of sense 🙂], but here it is. Transcribed from my pen-and-paper journal. How is NaJoWriMo going for Me? I am keeping up with the Renewal prompts every day. 46 pages in 17 days for me is pretty good, I think. Some days I have more time and energy than others. There have been entries that have been a single page with bullet lists, or mind maps. Other entries are six or more pages long, when I’ve had the time and the energy to dig deeper into a prompt, or I’ve encountered a prompt that speaks more deeply to me. When I wrote my 101 items for my personal bucket list, I was only expecting to come up with ten, or twenty-five items. But I just kept going. What Could I Do To Keep Up? Make. The. Time. I am not a morning person, and I like to be in bed by midnight. Make use, make BETTER use of the time between 10:00 pm and midnight to write. First off, I am learning that there are many small things that, if I did them consistently, could really improve my outlook and my life. Gratitude lists. Reviewing the bucket list and renewal list can help. Many of the things I identified on day one in my renewal list also appeared on my personal bucket list. The renewal list was 45 items, the bucket list 101. There are may themes that crop up as part of my renewal. Self esteem. Improving my health. Decluttering. Learning to communicate better, more clearly, more assertively. Connect with the people who matter. Be kind – to myself and to others. I am learning that unless I make a concerted effort to reread my entries, I lose track of what I have learned, what I hope to do with what I learn. I am learning that unless I make a concerted effort to reread my entries, I lose track of what I have learned, what I hope to do with what I learn. The next time I do this I will use a prompt every second day. The non-prompt day will be a day of reflection and reinforcement on the thoughts, feelings, and learnings from the previous day. I don’t feel I have or make the time each day to reflect on the previous day AND write today’s prompt. This time I have made the daily prompts the priority over the reflection of the previous entries. I will make time in May to review and truly absorb and reflect upon what my month of writing’s impact was on my life. I will have hours on a plane Wednesday that may help me dig deeper and reflect as well. I did not think that I had anything to say outside of my own little bubble. Yet as I wrote that entry I found I have very loud thoughts about technology and work and how technology was meant to give us leisure time when in fact it lets work interfere most intimately with our leisure time, family time and general supposed-to-be-away-from-work time. I’m not happy about it. I don’t know how to change it, or improve it yet. I feel like I am one foolish man. How can I possibly make a difference? No one but my journal listens to me. I try to make myself invisible, even though I feel a need to change the world. Is it possible to quietly change the world? It begins with changing myself (not drastically, not an overhaul of who I am). Changing myself can only help me grow and change the world. Which comes first? Me changing, or the world changing me? …my journal is a great place to get my thoughts out where I can see them, play with them, turn them about and rethink them. Benefits of Writing Every Day? It gets my thoughts, tensions, worries and gratitudes out of my head and down on paper. I tend to overthink things, and my journal is a great place to get my thoughts out where I can see them, play with them, turn them about and rethink them. Writing each day with a prompt helps to get me focused more quickly. I expand my thinking from simply an entry reflecting on the day’s events and my thoughts and feelings about those, but thinking more deeply and thinking critically. I don’t always believe what I write, and then I write about that disbelief! I am still free to write whatever I want, the prompt gets me writing better soon. By day, Steve is an IT applications manager for a mortgage company. By night and weekend he is a singer, storyteller and avid journal writer. He has been journal writing for more than 27 years, primarily by hand. He most of all is a father to a lovely daughter, and the husband to a very patient wife. Please share your feedback with what Steve wrote. How is your journal writing going? What did you get out of NaJoWriMo, and what advice do you have for other journal writers? Please also share you testimonial about NaJoWriMo and journal writing. Click here to fill out a simple three-question form. Commit yourself to writing something every day for thirty-day days. It will help you grow as a writer and give you material to work from in the future. Use your creativity to make something wonderful. Get busy, write! I’ve been journaling for a year, fairly consistently, and completed NaJoWriMo in July. I am learning so much about myself from journaling. Thanks for your support and encouragement and your ability to put together the prompts which lead to deeper understanding. Keep up the excellent work. Really appreciated by this fellow journaler. I have been journaling forever. All of my writing can be considered as journaling. NaJoWriMo provides a layer of structure and digital cataloging that I need and didn't have prior. I'm able to keep my projects on track and, at the same time in the same format, delve deeper into my personal thoughts and writings.